The Citrix Receiver (XenApp plugin / Online plugin / ICA Client / WinFrame client) has a file association with the .ICA extension. This means that each time you open a file with the .ICA extension the Citrix Receiver is launched to interpret the file (and act upon the content of the file). In this article I’ll explain how the .ICA file is constructed, what sections and properties are commonly used and how you can create the file. 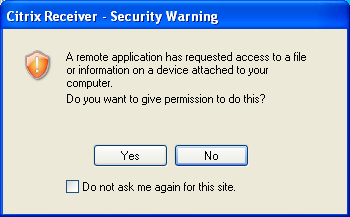 When you’ve worked with a Citrix XenApp or XenDesktop environment you must be familiar with the Security Warning dialog. It prevents a remote machine (your hosted application or desktop) from accessing resources on the client device, a security boundary you want to protect when from unmanaged systems. But on managed systems you want to prevent this message, you don’t want your users to be confronted with a message you tell them to accept (otherwise it won’t work and they’re to blame). In this article I’ll explain why this message is displayed and how you can prevent it.